These two photos show two contrasting labyrinths. 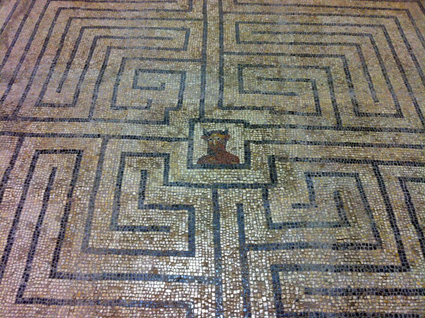 The mosaic of a labyrinth with the Minotaur at its centre was captured by Joe Saul and is from the Roman ruins at Conimbrigia, Portugal. 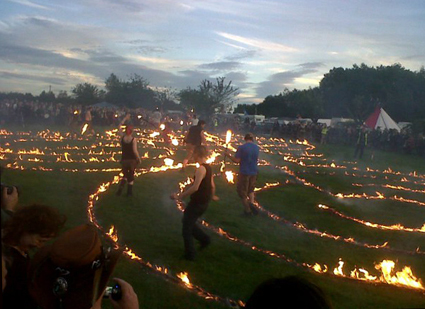 The picture of a burning labyrinth was taken by Joolz Darling at the Mercian Gathering in the summer, where she also took the pictures of a burning wicker man and a fire breather that I posted on my blog a few weeks ago. Labyrinths are different from mazes. Labyrinths can be in a variety of different designs, but are always a single path that folds and winds back on itself, leading eventually towards the heart of the pattern. A maze is made up of diverging paths with a choice of routes, many of which are dead ends but only one correct way to the middle. Labyrinths are found in cultures all over the world and throughout history, and many have spiritual or religious significance. The Signs and Symbols Bible says: "Labyrinths are represented symbolically as drawings or physically on the ground, where they can be walked from their entry points to the centre and back out again. Historically they have been used in both group rituals and for private meditation. The labyrinth symbolises a psychological or spiritual journey to the centre of one's psyche or soul, to experience insight and then return to the everyday world transformed." It seemed timely to post these pictures this week, as on Friday, 26 October, Robert Stephenson is giving a talk on Labyrinths and Mazes Worldwide at Research into Lost Knowledge Organisation (Rilko). The venue for the talk is the Theosophical Society, 50 Gloucester Place, W1U 8EA. The Doors open 6.45pm and admission is £5 for Rilko members and £7 for non-members. The photos are copyright Joe Saul and Joolz Darling and are used with permission. Please do not download or copy them without permission. On a tangential note, I saw the old 70's R&B group, Earth, Wind and Fire in concert about two weeks ago. They still got it!!! !